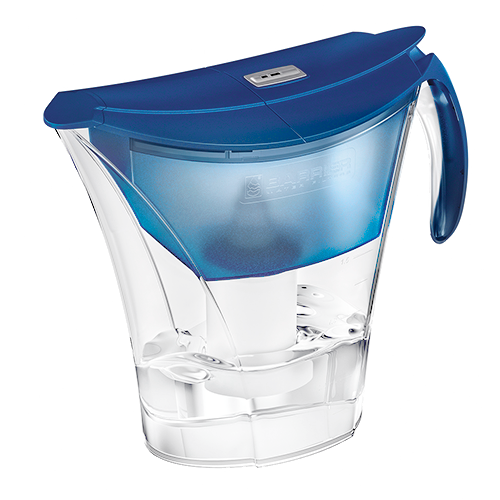 Finally, using water filters is surely more convenient than purchasing more and more bottled water. Filter cartridges cost less and bring you more clean water. 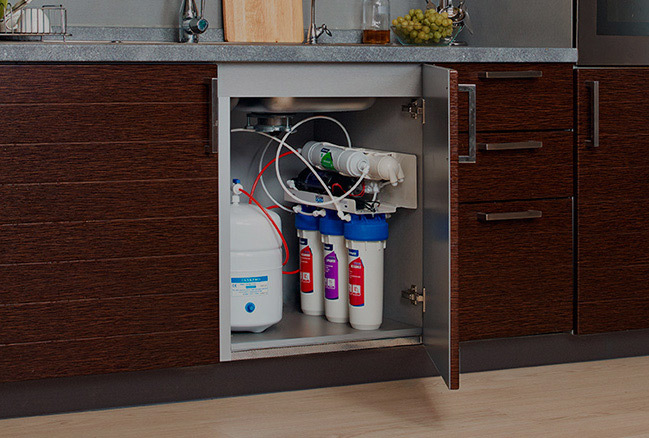 BARRIER® was founded to bring you an entirely new concept in home drinking water filtration—we are the first to offer specialized filters for different types of tap water, which vary according to your geographic region. 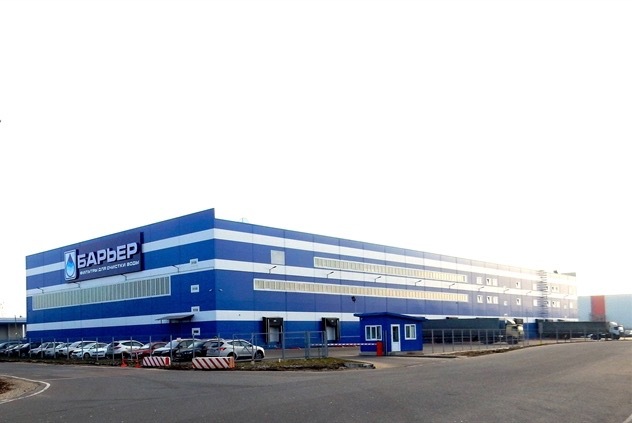 In 1993, our parent company founded the water treatment market in Russia. Twice, customers named us the #1 brand in the water filter category, and three times in a row, we were awarded the golden prize at the Brand of the Year competition. Soon after, our success spread across Europe and Asia. 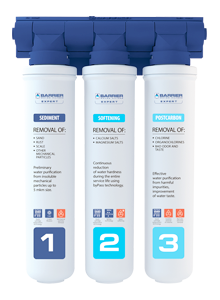 BARRIER® products are recognized for combining the latest advances in science, engineering and technology, and for meeting the most stringent local and international water quality standards. Can’t I boil my tap water instead of filtering it? In some parts of the world, due to the water source’s initial composition, heavier chlorination is necessary at the water treatment plant. When boiling, the water undergoes complex reactions, producing even more hazardous toxic compounds including dioxins. The newly produced compounds are so strong that they cannot be reduced from water by boiling. Therefore, boiling is only recommended when chlorine and organic chlorine compounds have been reduced from the water, or when water treatment plants recommend boiling to make it safe. 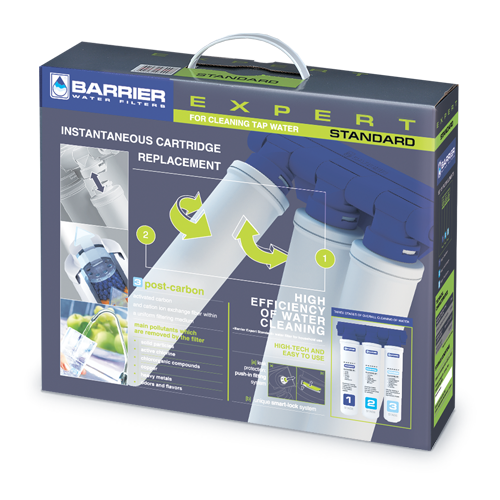 How often should I replace my BARRIER® filter cartridge? 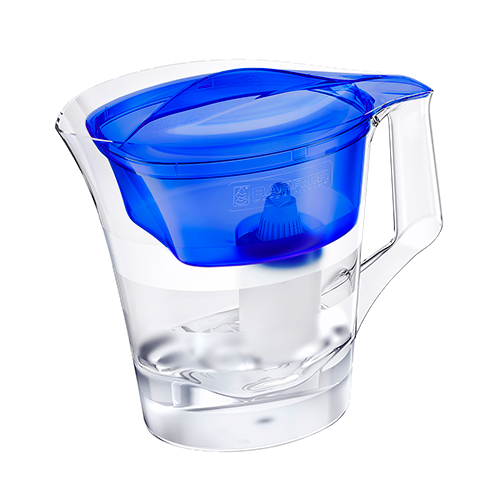 To remind you of the filter replacement date, every water pitcher filter is delivered with a filter replacement indicator (calendar disk or microprocessor-based). Each indicator will remind you of the correct date for filter cartridge replacement. If you have hard water, you’ll see a powdery white crust on your faucets, heating elements in your dishwasher or coffee maker or on cooking utensils. This substance is formed from excess calcium and magnesium salts. The sooner the formation appears, the higher the salt concentration in the water. Excessive hardness should be eliminated because excess concentrations of calcium and magnesium salts are unhealthy. These salts increase the risk of stone formation in the kidneys and in the gall bladder. 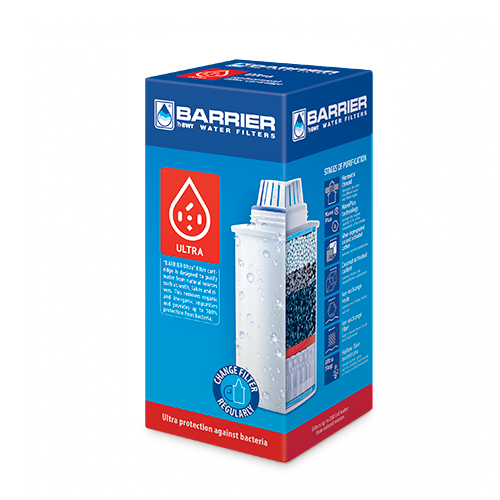 Special BARRIER® filter cartridges are available for decreasing water hardness. What’s inside a BARRIER® replacement filter cartridge? 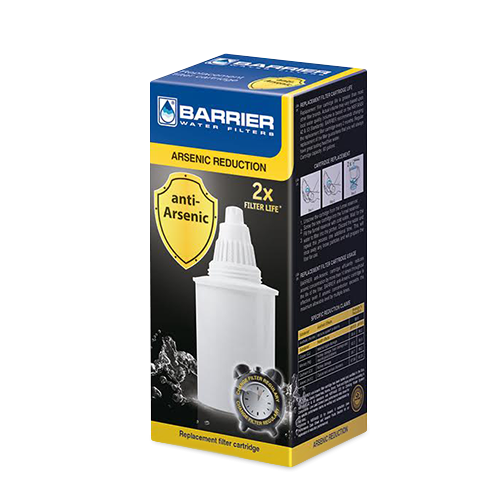 High-quality activated charcoal is the main element of BARRIER® replacement filter cartridges. It is treated with our exclusive Unique Silver Impregnated Carbon Technology (USICT) in low concentrations. Silver is known to reduce the proliferation of harmful microorganisms. 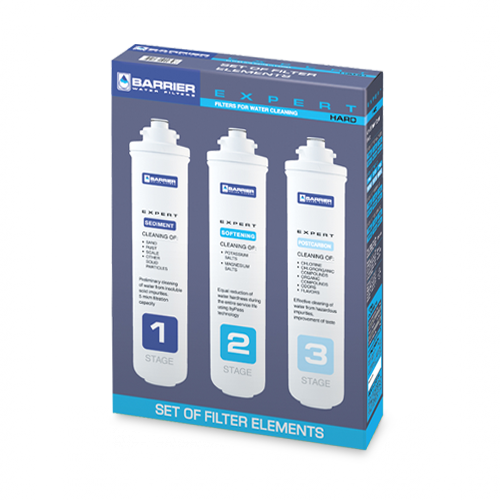 Each filter cartridge also contains ion exchange resin that reduces ions of toxic metals and decreases hardness in tap water. 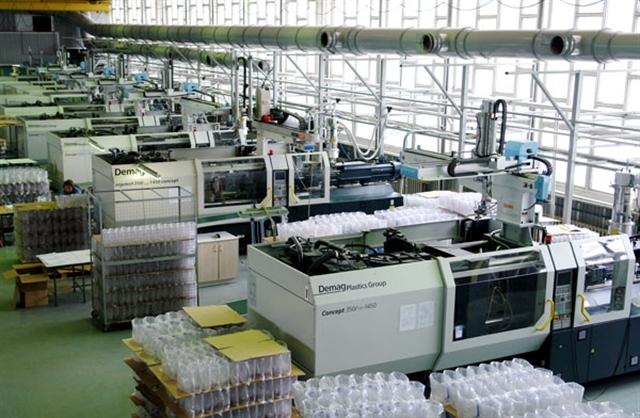 Which is better – bottled water or filtered water? 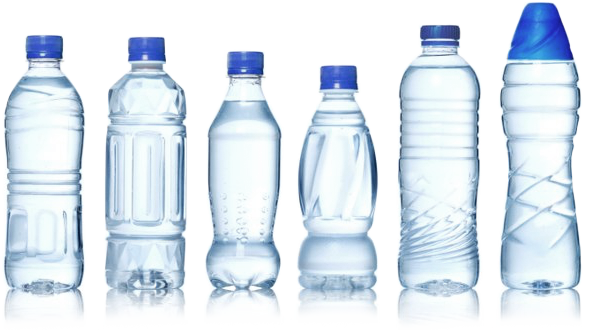 Bottled water is generally filtered water (unless it is mineral water). Before bottling, it is filtered using reverse osmosis (RO) or a simple sediment filter. Or it may not be filtered at all. Regardless, consumers have no way of knowing how long this water has been stored before you drink it. During that time, certain substances contained in the package material, including ingredients from the bottle itself, may leach into the water. How do I know what’s in my tap water? For an accurate analysis, consult your local municipality. They can usually suggest a testing facility. But even without testing, there are certain clues to the composition of your water. Perhaps you notice a strong chlorine taste or odor. If your water is hard, you’ll see a whitish crust on your faucets or at the bottom of your coffee maker or teapot. If you have brownish-orange stains on your fixtures or you notice a metallic taste, your water has a high iron content. 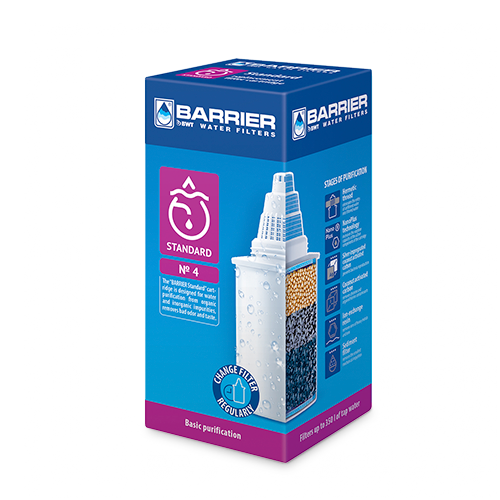 Only BARRIER® offers filters for specific water problems—to reduce excess hardness or iron, add fluoride or for standard filtration. Is it true that water can be treated with silver? Silver has water disinfection properties and as such, it is a natural inhibitor of bacteria. 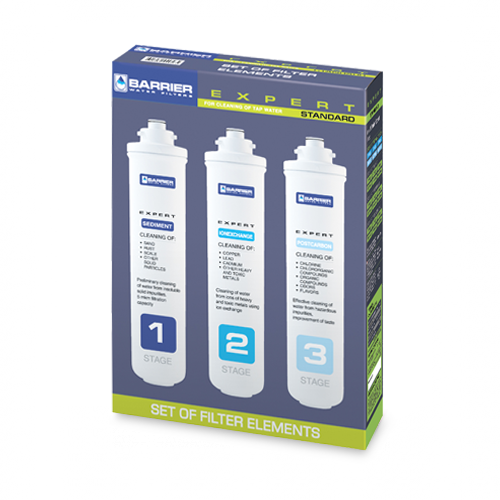 BARRIER® filters contain a Unique Silver Impregnated Carbon Technology (USICT) to reduce the possibility of bacterial reproduction within the filter cartridge. 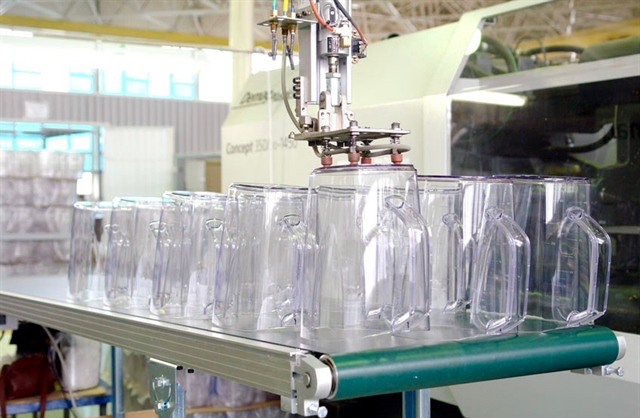 What’s the difference between BARRIER® pitcher models? Our pitchers differ by their capacity and their convenience features. 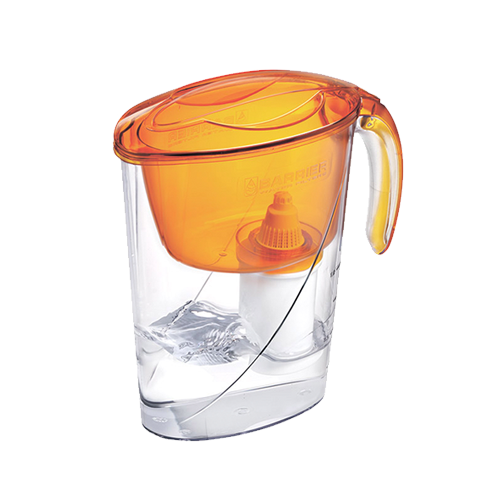 Differences include a rubber footing that protects surfaces and keeps the pitcher from slipping, or an electronic microprocessor replacement filter indicator as opposed to a mechanical or manual one. All BARRIER® replacement cartridges fit in all BARRIER® pitchers. 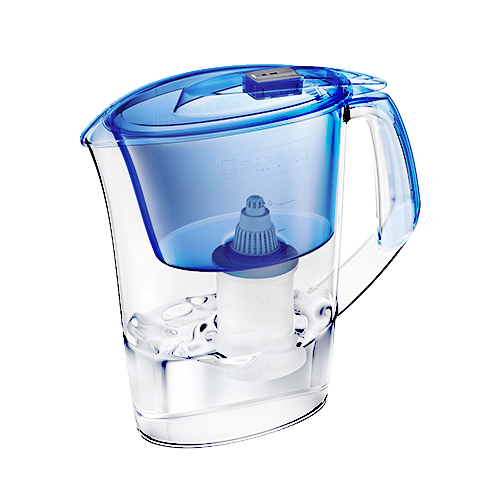 Which is better, filtered or distilled water? Filtered water is preferable. Distilled water is “dead” water. It contains none of the salts that our bodies need, and the pH balance is far from the normal value (distilled water is acid water). Our bodies require not only liquid, but a number of other substances dissolved in the water. Water is chlorinated at water treatment plants to substantially reduce the number of bacteria and microorganisms, however, the chlorine itself is not removed from the water. Therefore, the tap water that comes into your home contains chlorine and organic chlorine compounds. Drinking water isn’t the only way these compounds enter our body. Some may be absorbed through the skin when taking a shower or a bath or inhaled when cooking or washing. Organic chlorine compounds have a toxic effect on the body causing malfunctions of the cardiovascular and reproductive systems. All BARRIER® water filters are certified by the Water Quality Association (WQA) and are effective at reducing the taste and smell of chlorine (aesthetic chlorine). Why can’t I just let my water sit so that the harmful contaminants will fall to the bottom of the container and other chemicals will simply evaporate? During this process, only volatile matters such as chlorine will evaporate from the water while most substances will neither be evaporated nor deposited. They remain suspended in the water. Lack of energy, low spirits and dry, itchy skin after a long winter are common complaints. Save your money on all those high-priced creams and lotions—the simple solution may be drinking more water. It’s often recommended that healthy adults drink eight, eight-ounce glasses of water every day. But during the spring our body requires even more water than usual. For normal metabolism and recuperation, the human body requires a regular supply of clean water. Water contains many elements required for good health. Water helps maintain immunity and guard against various viral diseases. If you think about it, when you are ill, you’re thirsty and never hungry. This is because water helps you recuperate and guard against pathogenic organisms. But what about losing those extra pounds we put on in the winter? The easiest solution? Drink more water. In many cases, hunger is really thirst. So when you’re hungry, have two glasses of water instead of food. If it was a false sense of hunger, the urge to eat will disappear. You’ll significantly reduce the amount of food you consume. As soon as your metabolism recovers, it gradually changes your taste preferences, and instead of fattening carbohydrates, you’ll choose more fruits and vegetables. But it’s hard to drink more water when you’re not sure about the contaminants in your glass. Take iron, for instance. You can tell if your water has a high iron content by the brownish-orange stains on your bathroom fixtures and by its metallic taste. Continuous consumption of water with excess iron concentration (more than 0.3 mg/l) increases the risk of myocardial infarction and affects the human reproductive system. If your water is hard, it has a high level of calcium and magnesium salts. Telltale signs are crusty deposits in your teapot or on the outer edge of your sink faucets. Regular consumption of hard water may cause kidney stones and skeletal calcinosis. In these cases, water hardness should be reduced. Other harmful substances are introduced into our water supply by human activities. Lead may come from improper disposal of car batteries. Mercury may come from carelessly broken and disposed of fluorescent or CFL bulbs. Nickel is a common component of stainless steel items. And chlorine kills pathogenic organisms found in the water, but it also has carcinogenic and mutagenic properties. Regular consumption of chlorinated water may increase the risk of cancer and it may be genetically harmful. Even showering with overly chlorinated water can be harmful. It can cause itchiness and allergic reactions. When our skin feels dry and tight after a shower, we reach for creams and lotions, most of which offer only temporary relief. Chlorine also enters your body through your pores and your lungs actively absorb it when you inhale the fumes. Chlorinated water is specifically hazardous for those with lower immunity, such as the children and expectant mothers. Is it necessary to filter all the water in your home? There are several different brands of filters. When it comes to our health and safety, we often choose the one that’s most expensive, but that doesn’t mean it’s the best choice. Here are some common myths related to advanced tap water treatment. Myth 1: All water should be treated to conform to the drinking standards. Advanced water treatment that conforms with NSF drinking water standards is only required for drinking water and cooking. Myth 2: The more expensive the pitcher filter, the more effective it is. 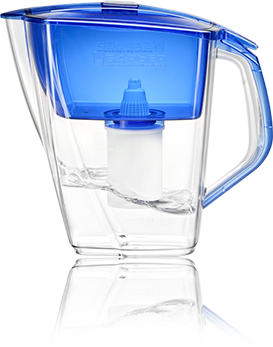 All brands of pitcher water filters use charcoal filters. These filters reduce various pollutants from tap water, except pathogenic microorganisms—their reduction depends on the quality of activated charcoal used in these filters. 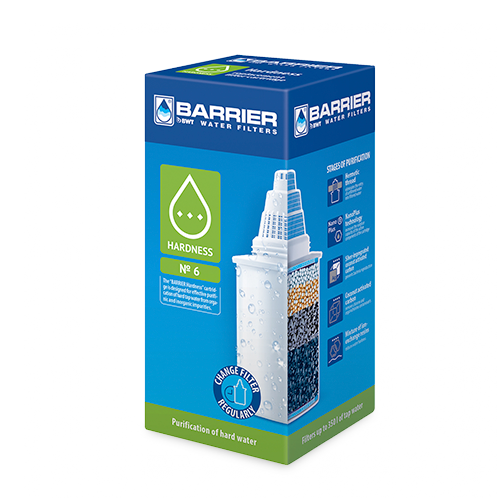 BARRIER® replacement filters contain only high-quality coconut activated charcoal. Myth 3: Boiling chlorinated water makes it safe to drink. In some parts of the world, due to the water source’s initial composition, heavier chlorination is necessary at the water treatment plant. When boiling, the water undergoes complex reactions, producing even more hazardous toxic compounds including dioxins. The newly produced compounds are so strong that they cannot be reduced from water by boiling. Therefore, boiling is only recommended when chlorine and organic chlorine compounds have been reduced from the water. BARRIER® strongly recommends paying specific attention to your local water issues and treatment problems. 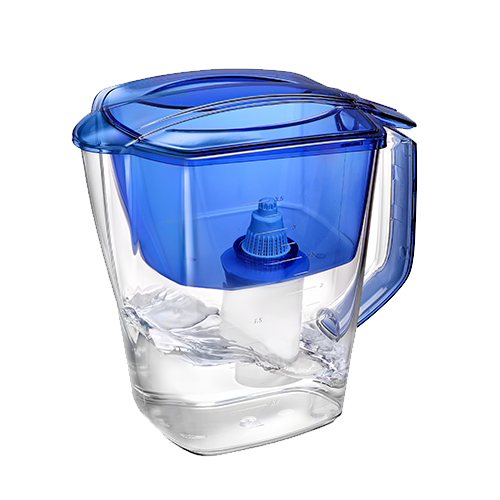 Before buying a water filter, compare various brands to see which one suits your needs best. Filtered tap water is always recommended for better taste. Why do we treat tap water? We like to think that our tap water is clean and safe. After all, it passes through a water treatment plant where it’s disinfected and made suitable for drinking. In theory, this is correct, but it’s not the full story. After water treatment, water is suitable for drinking, yet it often retains a strong chlorine smell. Chlorine is added to substantially reduce the number of bacteria and microorganisms in the water. But chlorine isn’t the only issue. To flow from our tap, water has to travel a long distance through old, deteriorated pipelines, which may shed particulate salts of heavy metals and inorganic iron (rust) that can contaminate the water. The plumbing in our home can affect water quality, too. Additionally, chlorine left in the water after treatment at the water treatment plant undergoes multiple reactions in those pipes producing organic chlorine compounds. This water may contain dangerous compounds for drinking even after boiling, as organic chlorine compounds may form very toxic substances when heated. If your home has older plumbing, this can also leave deposits in your tap water. 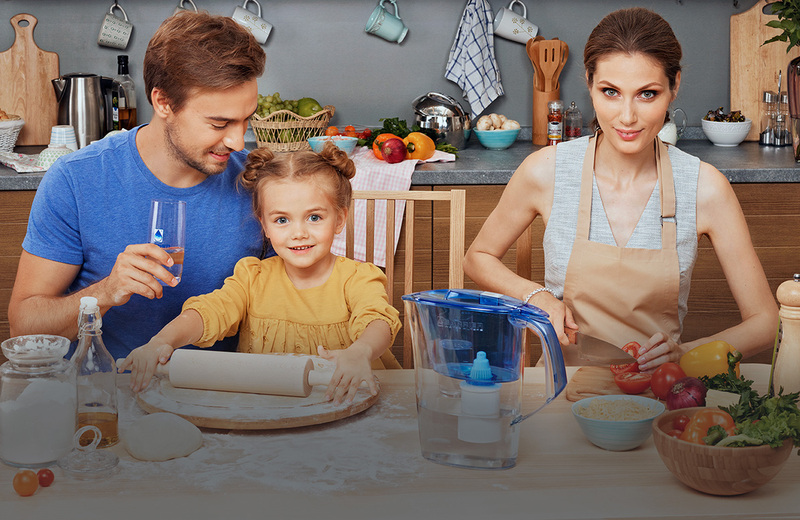 While treating drinking water is an essential part of a healthier life, water filters help improve taste and color, reduce offensive odors and make it safer for human consumption. Water is something that we take for granted. In 1962, President John F. Kennedy said, “Forget about oil, think about the water.” There’s even been speculation that water shortages may occur much earlier as our natural fuel reserves come to an end. is continually growing. According to United Nations forecasts, the global population will grow from 6 to 8.5 billion people by 2030, making the current water situation even more critical for future generations. Research carried out by international organizations attests to the current water crisis in many regions of the world. According to data from the World Health Organization, 1.4 billion people have no access to safe drinking water. As a result, over 1/3 of the total population, or 2.2 billion people, die annually from diseases caused by the lack of quality water resources, and 250 million people suffer from other unhealthy water-related diseases. In most cities, old technologies such as chlorination are still used for drinking water disinfection. However, along with the advantages, including removal of typhus, dysentery, cholera and plague bacteria from water, this method also carries risk. When chlorine reacts with some organic substances in treated water, there remains a risk of the formation of a range of carcinogenic and toxic compounds like carbon tetrachloride and chloroform, and under certain conditions, hazardous poisons or dioxins. It is also important to note that when dissolved chlorine in the water enters the stomach, it eliminates not only pathogenic, but good microbial flora as well. To function properly, the adult human body requires the consumption of approximately 64 ounces of water per day. Filtered water is a key component for good health. Here are some simple tips. When you start your day with a glass of water, you’ll make up for any dehydration caused by sleep. Water should be consumed before a meal. To complete the digestion process, it’s best to drink 30 minutes before and 2.5 hours after eating. However, don’t drink water after fatty meals (this will retain food in your stomach) and after eating fresh fruits (this promotes gas). Are there white or cloudy deposits in your coffee maker or teapot? Does your dishwasher or hot water heater have deposits on the heating element? Have you ever noticed that your tap water doesn’t lather well? Do you see white crusty deposits on your sink taps? Welcome to hard water. If you answered "Yes" to any of these questions, your water is hard. Hard water comes from calcium and magnesium salts dissolved in water. 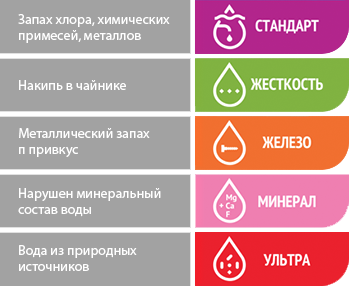 These salts are required for proper development of the human body. However excess hardness salts may be harmful to your health, and may lead to kidney stone and gall bladder stone formation. Hardness in tap water should be regulated, but not completely removed, because some hardness salts are good for health. Excessive hardness can easily be reduced through specialized filtering known as water softening. Only BARRIER® offers a specialized filter for hard water. This is the strong-smelling water that pours from the tap in many parts of the U.S., stains your sink and tub and has a noticeably unpleasant odor. What’s the relationship between iron and water? Sure, water makes iron rust. Surprisingly, there are many varieties of iron found in ordinary tap water. Ferrous iron is present when a red-brown deposit forms on the bottom of the vessel containing it. Colloid iron contains tiny insoluble particles or colloids. Instead of leaving deposits, they remain dissolved and suspended in your glass. This type of water appears yellow-brown. Bacterial iron occurs when iron combines with bacteria. Some microorganisms use the energy of dissolved iron in their life cycle. They transform ferrous iron into ferric iron, which is preserved in a jelly-like capsule around a bacterium. Iron also appears in our water from deteriorating water supply facilities. In certain areas of the U.S., substantial iron deposits have formed in old pipelines which deliver our water, and appear when we turn on the faucet. Although the water meets sanitary inorganic iron requirements, it’s less than pleasant to drink with a strong metallic taste. When tap water passes through rusty old pipes, it changes the water’s chemistry and creates chemical compounds. There is a possibility that continuous consumption of water with an increased iron concentration (more than 0.3 mg/l) increases the risk of myocardial infraction and affects the human reproductive system. Removing iron from water is essential, since excess intake may be linked to serious oncological and other diseases. Filtering reduces iron from water. Filters are also used to reduce excess concentrations of inorganic iron while performing basic water treatment by reducing other major pollutants or contaminants. Activated carbon water filters provide optimal water treatment for household use. They contain activated carbon as the basic absorbent component. Currently, there are many manufacturers of activated carbon water filters. Activated carbon effectively absorbs many key impurities from tap water. It absorbs chlorine and organic chlorine compounds. Chlorine is added to water at the water treatment plants to avoid proliferation of pathogenic microorganisms. Organic chlorine compounds are generated in water as a result of chlorine interaction with naturally occurring organic substances present in the water. All of our drinking water comes from surface sources such as rivers and lakes. Rivers mainly originate from swamps with humus or humic acids. All activated carbon household water filters should reduce chlorine and organic chlorine compounds from tap water. Their effectiveness depends on the activated carbon quality. The activated coconut carbon contained in BARRIER® filters is produced in environmentally clean areas of Sri Lanka and is coupled with our Unique Silver Impregnated Carbon Technology (USICT) to reduce the possibility of bacterial growth within the filter cartridge itself. Although water from water treatment plants is generally safe to drink, if you live in a rural area where drinking water is taken from open sources such as shallow wells, it is recommended that you filter your water through a activated carbon filter and then boil it to effectively reduce the concentration of microorganisms. Water treatment filter systems are also recommended because they preserve the initial mineral composition of drinking water including any useful microelements. A method of water de-ironing. Aeration is the treatment process whereby water is brought into close contact with air serving as an active oxidation catalyst in the water tank. The aeration process is used for water de-ironing, biological wastewater treatment and reduction of gases in the water, which may give off offensive odors. Activated (active) carbon is a porous material consisting of carbon, manufactured from fossil material or wood charcoal by the reducing of resinous substances and carbonization of polymers. It is a highly permeable material with a large surface area which makes it very absorbent, trapping the smallest particles including chlorine and organic chlorine compounds (chloroform), pesticides, petroleum derivatives (benzene), and reducing offensive odors and tastes. In water treatment filters, it is used in granulated form or powder. A replaceable container with the filtering mixture (media) used for trapping of water impurities. BARRIER® cartridges differ depending on the filter media. 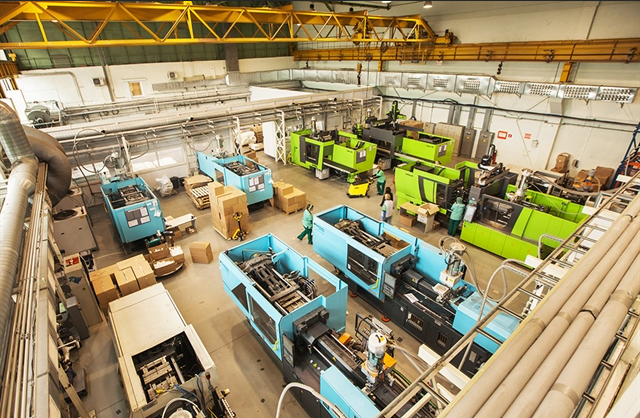 Cartridges are available for hardness reduction, iron reduction, adding fluoride to the water or standard filtration. BARRIER®’s NanoPlus® technology reduces contaminants by up to 99%. Our filters also contain high-quality activated carbon coupled with Unique Silver Impregnated Carbon Technology (USICT), which filters the taste and smell of chlorine, as well as ions of heavy metals such as copper, mercury and cadmium. The addition of silver reduces the possibility of bacterial growth within the filter cartridge. A process in which dissolved inorganic solids (such as salts) are removed from water. This is accomplished by household water pressure pushing the tap water through a semi-permeable membrane, which is about as thick as cellophane. The membrane forms a barrier that allows only the water to pass through, not the impurities or contaminants. This method is not ideally suited for commonly treated municipal water, which often contains chlorine and volatile organic chemicals (VOCs). These contaminants are able to slip through the membrane. This method also produces acidic water, which can remove calcium and other essential minerals from healthy bones and teeth. According to the Environmental Protection Agency (EPA), approximately 15 percent of Americans obtain water from private wells, and these supplies are not subject to EPA standards, although some state and local governments do set rules to protect users. If you obtain your water from a well, you should take extra precautions to ensure the safety of your family’s drinking water supply. Contact your local or county environmental health department for a list of the state-certified (licensed) laboratories in your area. It may be convenient, but it is often just filtered tap water. Before bottling, it may be filtered using reverse osmosis (RO) or a simple sediment filter. Or it may not be filtered at all. Regardless, you have no way of knowing how long this water has been stored before you drink it. During that time, certain substances contained in the package material, including ingredients from the bottle itself, may leach into the water. Water fluoridation is often referred to as one of the ten great public health achievements of the 20th century. For more than 60 years, many municipalities have added fluoride to their community water to effectively prevent tooth decay. 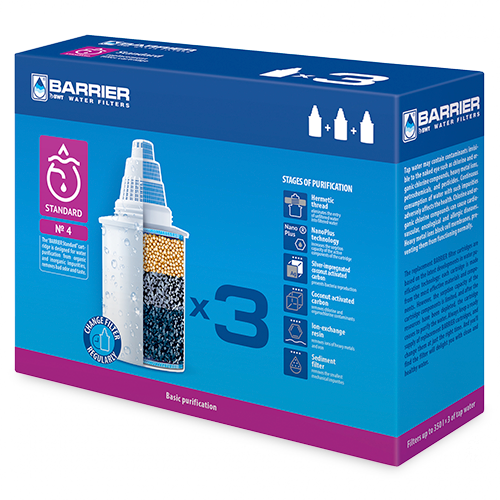 For parents who live in communities that do not fluoridate, or who obtain their water supply from private wells, BARRIER® offers a filtration cartridge that adds fluoride to your family’s drinking water. As water moves through soil and rock, it dissolves very small amounts of minerals and holds them in solution. Calcium and magnesium are the two most common minerals that make water "hard." 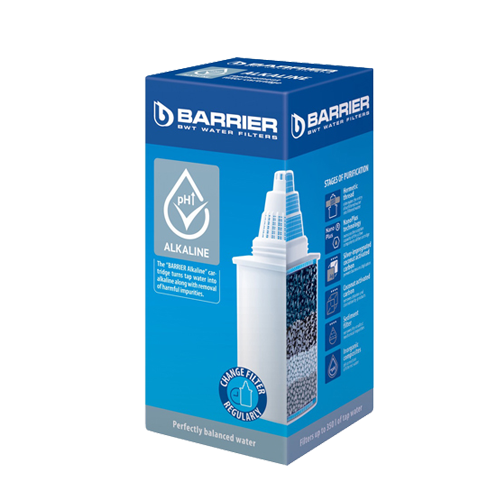 Only BARRIER® offers a special filter that reduces drinking water hardness while providing additional filtration. Iron comprises at least five per cent of the earth’s crust and is one of our most plentiful resources. As rainwater seeps through soil and underlying geologic formations, iron is dissolved, causing it to seep into aquifers for groundwater wells. Water containing ferrous iron is clear because the iron is completely dissolved, but it leaves a red-brown deposit on the bottom of the vessel that contains it. Colloid iron contains tiny insoluble particles or colloids. Instead of leaving deposits, they remain dissolved and suspended in your glass. This type of water appears yellow-brown. Bacterial iron occurs when iron combines with bacteria. Some microorganisms use the energy of dissolved iron in their life cycle. They transform ferrous iron into ferric iron, which is preserved in a jelly-like capsule around a bacterium. Iron also appears in our water from deteriorating pipelines. Along with health risks, iron gives water an unpleasant metallic taste. The presence of a vast array of prescription and over-the-counter drugs in public water supplies is a topic that has been gaining media attention. Although concentrations are minute, scientists are concerned about long-term affects on human health. BARRIER®’s NanoPlus® technology reduces contaminants by up to 99%, including antibiotics found in tap water.